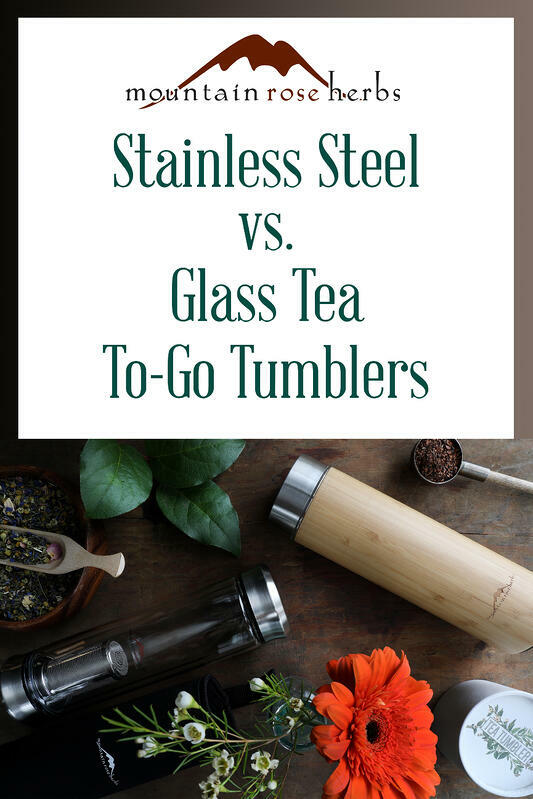 Stainless Steel vs. Glass: Find the Best Tea To-Go Tumbler for You! 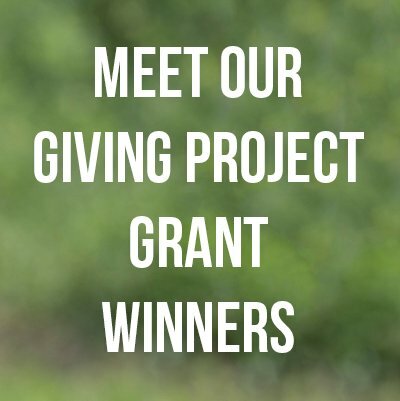 The folks here at Mountain Rose Herbs love our tea, whether it’s a good strong cup of Pu’erh, or the delicate taste of Kumaon white, or a selection from our immense variety of caffeine-free organic herbal tea blends. The days when we can spend time casually steeping a delicious cup are cherished, and we never get tired of concocting new tea blends in the kitchen.For beginners, brewing loose tea can sometimes seem like a daunting task. There are so many accessory options — tea spoons, baskets, mugs, teapots — which is why we’ve provided a handy guide to tea brewing! However when it’s time to take your tea on the road, tea tumblers are ideal for quick and painless tea brewing. 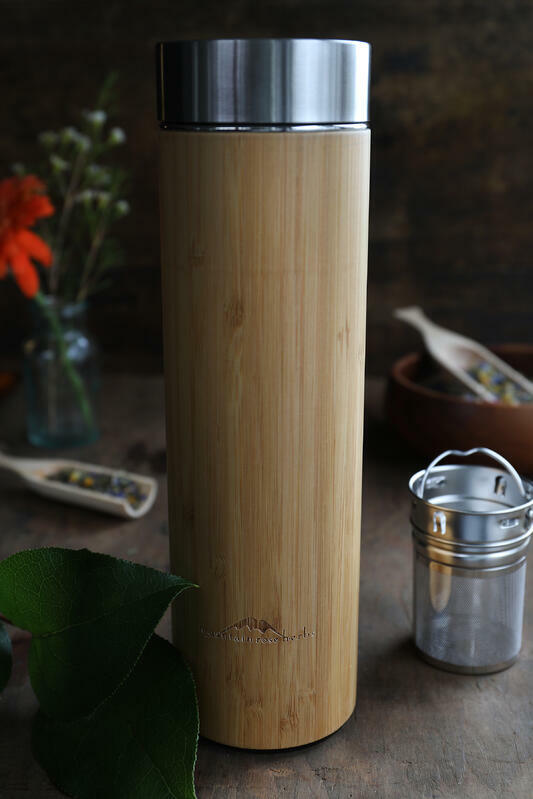 Our bamboo tea tumbler is perfect for all on-the-go activities. The natural exterior is both tough and beautiful. These loose leaf tea infuser travel mugs are created using natural materials, giving each its own slightly unique appearance. The interior is made from stainless steel and contains a removable lidded tea basket that detaches from the top. The outside of the tumbler is made with eco-friendly natural grain bamboo, and this vacuum-sealed, double-walled mug is designed to hold the temperature of hot or cold beverages for an extended period of time (folks here in the office report that their favorite brews stay warm through the entire workday!). Our clear glass tea tumbler is an attractive double-walled mug made of strong borosilicate glass. 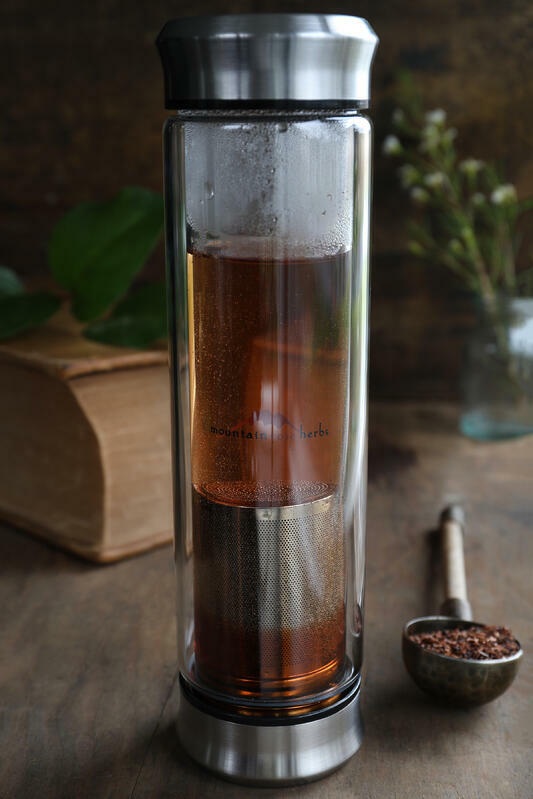 One helpful feature of this glass infuser mug is that its transparent walls allow you to watch teas steep until they reach your preferred strength! Another great detail of this tumbler is that both ends detach for super easy cleaning. The vacuum-sealed, double-walled mug is also designed to hold the temperature of hot or cold beverages for hours. The main difference between these to-go tumblers is in the materials. 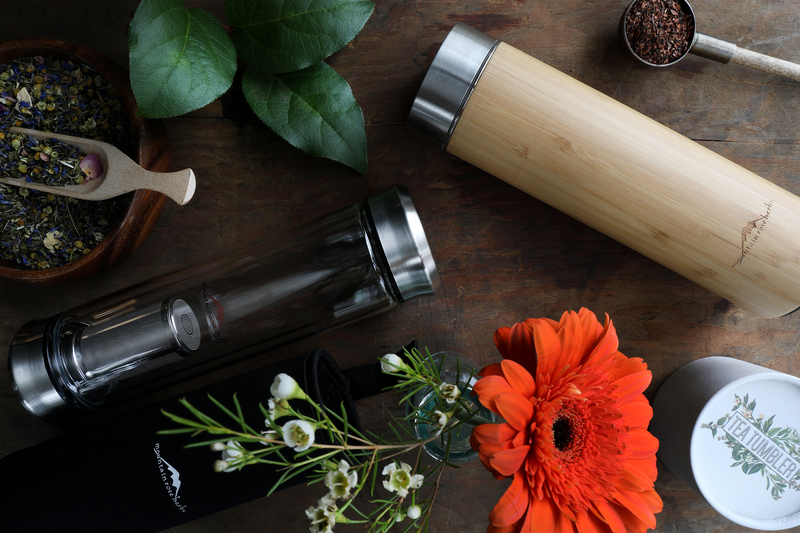 While the glass infuser is made to be durable, there is still the possibility for breakage, so the bamboo mug may be a better option for those of us who tend to leave our travel mugs rolling around in the car. However, if you tend to be a little kinder to your canteens and like to admire the beauty of your hot and a cold infusions, opt for the glass version to enjoy the show! 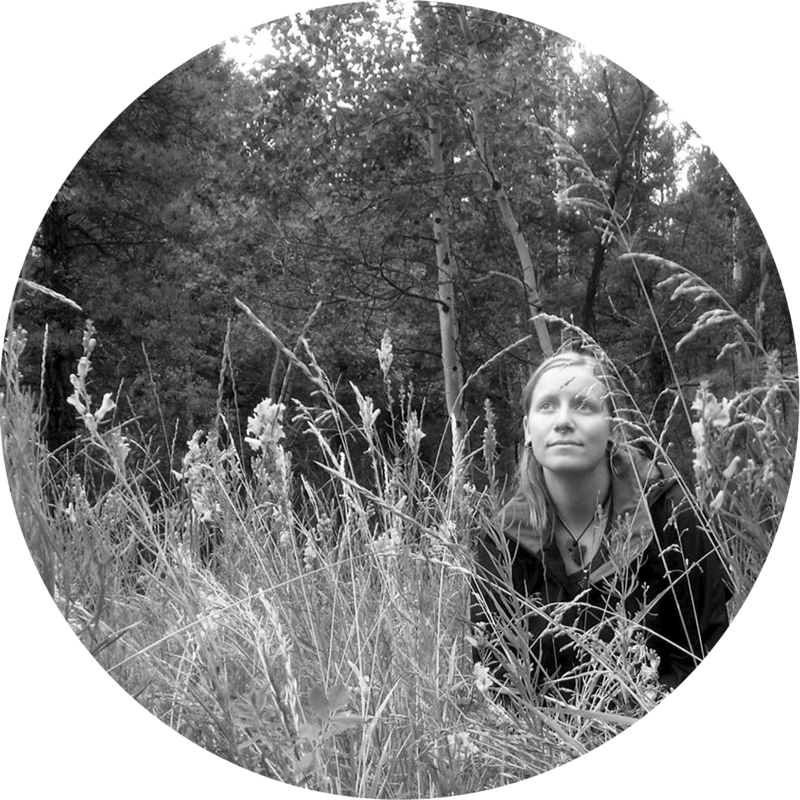 Want to create your own Custom Tea Blends? Use Our Guide to Tea Blending to Get Started!